Heterogeneity in malaria transmission is important to understand during elimination programmes, but the factors that lead to differences in transmission are complex. Hotspots of transmission have been identified in many vector-borne diseases, and during elimination campaigns this heterogeneity in transmission can help sustain transmission in areas where control has been effective. But, pinpointing the drivers of these differences in transmission is difficult. Therefore Opondo and colleagues looked at variation in mosquitoes to see if resistance to insecticides could explain hotspots of malaria transmission in The Gambia. Vector behavior, environmental variables, alternative hosts, genetics of hosts, or one of many other factors can drive heterogeneity in transmission of vector-borne diseases. Hotspots of transmission can be defined by either higher infection intensity in time or in space (Bousema et al. 2012). These areas are important for maintaining transmission year round and can enable persistence of a disease across the landscape. During elimination campaigns, it is essential to identify these areas for concentrated control efforts to (i.e. Bousema et al. 2010). Figure 1. Mosquito control methods in The Gambia. A. Indoor residual spraying with DDT is administered by the Gambia National Malaria Control Programme (GNMCP) (image USAID). 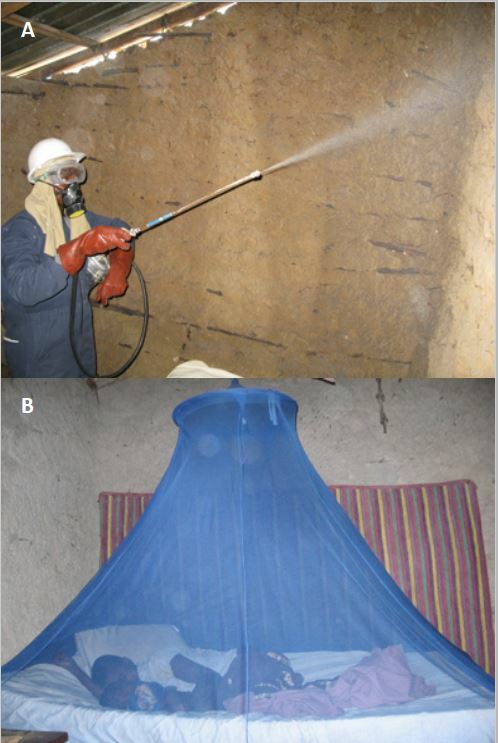 B. Long-lasting insecticide-treated bed nets (LLINs) were also used for malaria control and were administered during mass campaigns between 2013 and 2014 (image President’s Mosquito Initiative). In The Gambia, a combination of insecticide treated bed nets (ITNs; Fig. 1A) and indoor residual spraying (IRS; Fig. 1B) have decreased the incidence of malaria around the country. Now, the average infection prevalence for children under the age of five is 4% (but this ranges from 2-12% across the country). For their study, Opondo and colleagues selected paired villages in each of the six districts of The Gambia (Fig. 2). Each pair of villages was selected so one had high a high malaria prevalence and the second had a low malaria prevalence (in all but one district the differences in prevalence were significant). This prevalence data was available through a large national survey. Then, in each of the villages, the researchers collected larval mosquitoes from within the village and in the surrounding area. Figure 2. Map of sampling sites in The Gambia. The six geographic regions are numbered: 1 west coast, 2 LRR-N (lower river region-north), 3 LRR-S (lower river region-south), 4 CRR-N (central river region-north), 5/6 URR-S/N (upper river region-north/south). The dots indicate the locations of sampled villages: low malaria prevalence (green) and high malaria prevalence (red). The villages are: A Bessi, B Ndemban Tenda, C Chogen Wellingara, D Yallal Ba, E Sinchu Njengudi, F Dongoro Ba, G Sare Seedy, H Ngedden, K Madina Samako, J Njaiyel, L Sare Wuro, M Gunjur Koto. Figure from Opondo et al. 2016. The larvae were then transported back to the lab and raised using standardized WHO protocols. Adults that emerged from the larval stages were then identified to species using a genetic assay and tested for insecticide resistance. To quantify phenotypic resistance in each mosquito population, adult mosquitoes were exposed to either 4% DDT or 0.05% deltamethrin for an hour. In The Gambia, DDT is used in IRS and deltamethrin is used for treating nets that are distributed widely. Mosquito mortality was measured for 24 hours afterwards and death in excess of controls (3% mortality) was used as a metric for susceptibility to insecticide. Mosquitoes were also screened for five known genetic markers of insecticide resistance. Three species: Anopheles gambiae s.s., Anopheles arabiensis, and Anopheles coluzii were found in these surveys. A few hybrids of An. gambiae s.s. / An. coluzii were also found. The community composition of mosquitoes varied significantly between sites- both between paired (high-low) villages and across the country. In two sites, no larval habitats or adult mosquitoes were collected and therefore these could not be compared. The insecticide resistance of mosquitoes also varied between sites and between species. An. gambiae s.s. had the highest levels of phenotypic resistance to DDT – only 37% of mosquitoes died following exposure to DDT. An. gambiae s.s. also had the highest tolerance of deltamethrin. Resistance to each insecticide was correlated by site and it seemed as though resistance to DDT and deltamethrin may occur in the same individuals (though this was not tested). Additionally, mosquitoes originating from the eastern part of The Gambia (higher transmission) were more likely to have resistance to either of the insecticides. The frequency of resistance genes also generally supported findings that resistance is most common in An. gambiae s.s. and the eastern part of the country. How does this insecticide resistance relate to transmission in each of the villages? An. gambiae s.s. resistance to DDT was significantly higher in high prevalence villages than low prevalence villages. There was not enough resistance to deltamethrin or large enough sample sizes of the other mosquito species to test for other associations. The authors argue higher insecticide resistance in An. gambiae s.s. in villages with higher prevalence suggests a link between observed malaria prevalence in humans and insecticide resistance. This could mean that the development of insecticide resistance created more malaria transmission than there was originally. In South Africa and Senegal, control efforts actually increased insecticide resistance, which subsequently led to higher clinical malaria incidence. The Gambia National Malaria Control Programme (GNMCP) has applied control efforts uniformly across the country, suggesting that selection by insecticides should not vary between sites. However, behavior of mosquitoes, human usage, and community-level interventions could have played a role in increasing selection for insecticide resistance in some of the villages. Significant pressure from mosquito control programmes can select for resistance in mosquitoes (Read et al. 2009), which could led to hotspots of transmission. Insecticide resistant mosquitoes are associated with higher malaria transmission in The Gambia, but it is unclear at this stage what is responsible for driving higher transmission in certain villages. To identify mechanisms responsible for hot spots of transmission it will be important to consider micro-epidemiological factors in these villages in addition to insecticide resistance.